In 2007, the Faroes were rated the best of 111 islands by National Geographic Traveler, but it was only about a year or so ago that I realized I wanted to go. Initially, it was for solitude and the northern lights early in spring that I wanted to venture into the Arctic Circle, but skyrocketing tourism for both Iceland and the Lofoten Islands (which I found undeniably beautiful the first time I went) had me rethinking whether these two islands would really be the best places for that first goal. Aurora or not, I knew in the Faroes I’d at least be among the most remote places I’ve ever been, so the only thing left was to see if the weather would cooperate while I was there. 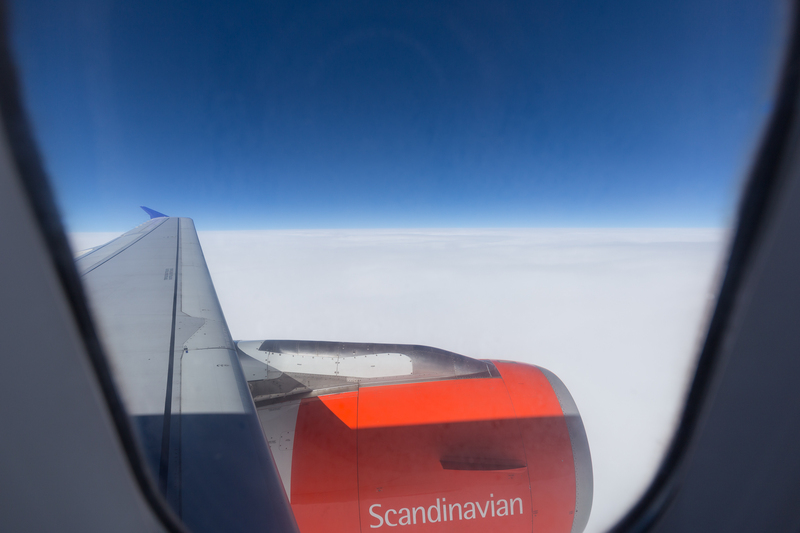 As I stared out the window during the my first flight from Munich to Copenhagen, I wondered selfishly if the brilliant blue skies we found ourselves in would be the last I’d see for the next ten days. With destinations as remote as the Faroes are, normally I’d plan out most days to know what my primary and backup plans would be, but the forecast was uncommitted and I didn’t have much time to research prior to my departure, so I spent most of my four hour layover in Copenhagen poring over website and book (a tremendous resource, for those interested) to figure out just what I was going to do for the next ten days. We landed just after a rain shower; my rental car was still dripping as I hefted my suitcase into the trunk. After a quick dinner, I unpacked my tripod, hiking sticks and gear, and lenses and filters and continued my studies. 2018 is not a great year for solar activity, clouds were practically perpetual (if dynamic) through the day and night, and I was sufficiently exhausted from the work trip the week prior, so I didn’t get to see the northern lights during my trip at all. Which was okay: daytime on the islands, or at least the nine of the eighteen I set foot on, more than offset the cold, late nights with too little sleep I would have endured had I chosen to go aurora hunting. 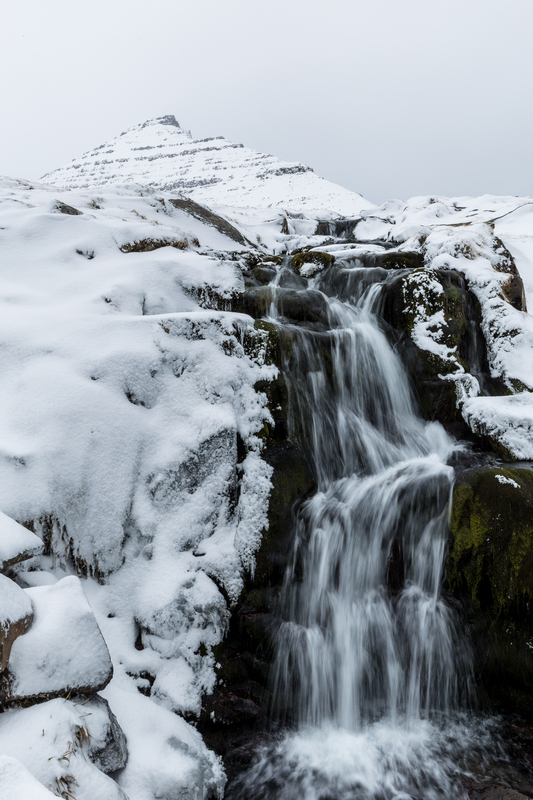 According to several Faroese, winters in April are usually more rainy than snowy, but my first three days in the Faroes showed the contrasty whiteness of northern winter climes more than the temperature lushness I had for some reason expected. Indeed, as I drove around Streymoy, the Faroes’ biggest island, I was caught in spells of whiteouts followed by relentless sunshine. I left Vestmanna with dark clouds overhead; fifteen minutes and a brief snow shower later, I pulled off the road above the village of Kvivik in brilliant sunshine illuminating the islands around me. 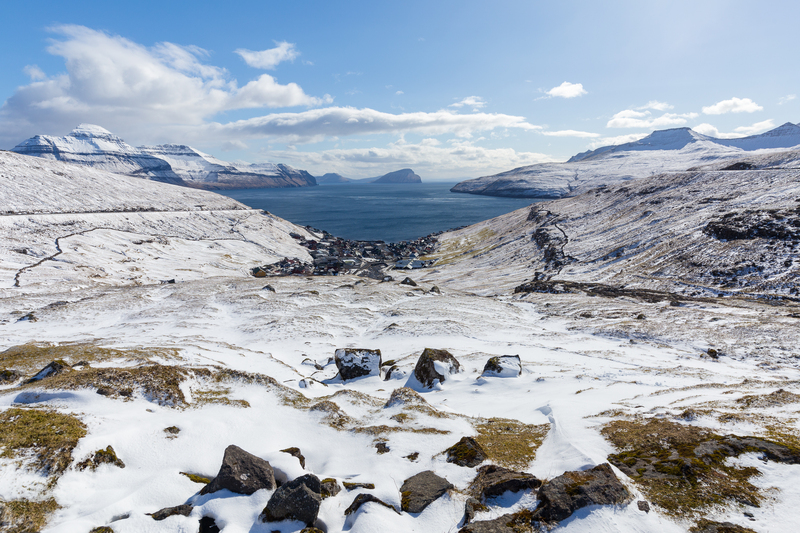 With this much snow more or less at sea level, most hiking paths were inaccessible, but muted were also the deep green hues normally characteristic of the Faroes. 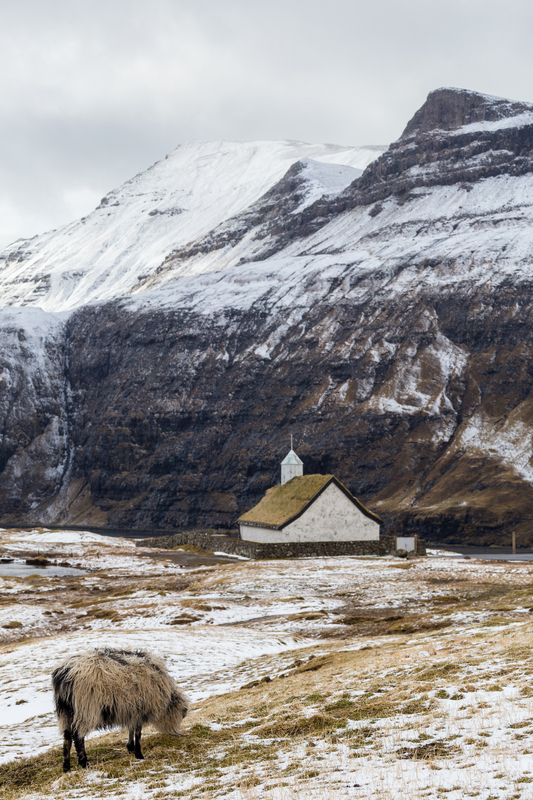 The church of Saksun — perhaps one of the Faroes’ most photographed — is set in a cove with deep, dark cliffs amidst fields of grass, but on my initial visit the sheep practically blended in with the snow and blanched grass. The snow gave the place an almost eery but wistful feel; the solitude I had sought out was provided in provided in generous helpings everywhere I turned. With around 250 km driven and as many photos to match, I called the first day successful, even if I didn’t spend as much time as I had hoped chasing the sunrise or clambering up to a mountaintop. The next day, Streymoy’s roads explored, I set out on Eysturoy (the Faroes’ second biggest island) for Funningur, which itself is next to the sea but whose connection to my next destination of Gjógv was over a mountain pass. Entranced by the landscape, I stopped the car to take pictures, eventually coming to a section of road steep and snow-covered enough for my car not to budge an inch further. It took turning off traction control for me to slowly gain enough momentum to climb the rest of the pass; a group of four Czechs offered their help before I, embarrassed, could start making headway again. I eventually passed a waterfall and stopped to do a u-turn (quite straightforward when there is no traffic around) to go back for another look. 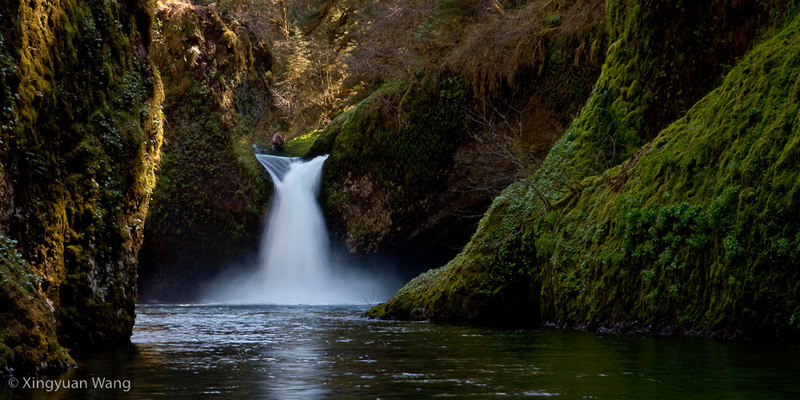 Here, too, the moss clinging to the side of the basin added a splash of color to the otherwise stoic rock, but it wasn’t the warm, rich green that I had for instance experienced in the Columbia River Gorge years prior. 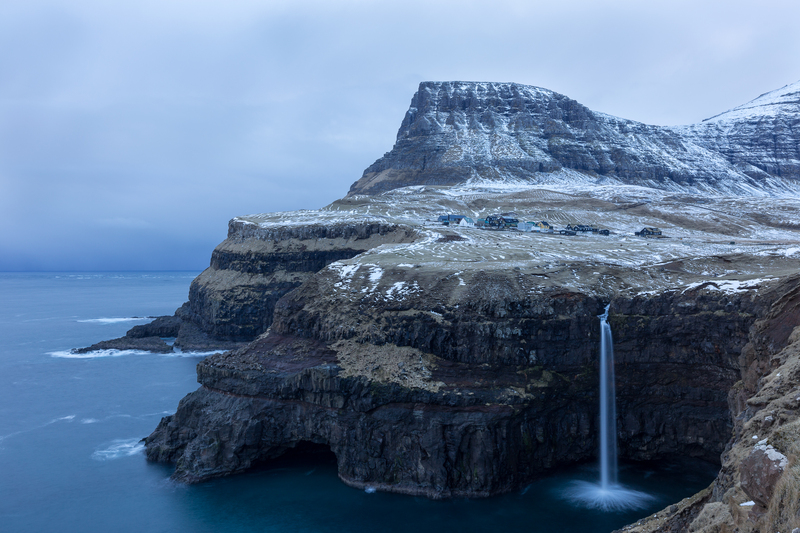 As I ventured across Esturoy and back onto Streymoy, I stopped at the Faroes’ highest waterfall, Fossá. 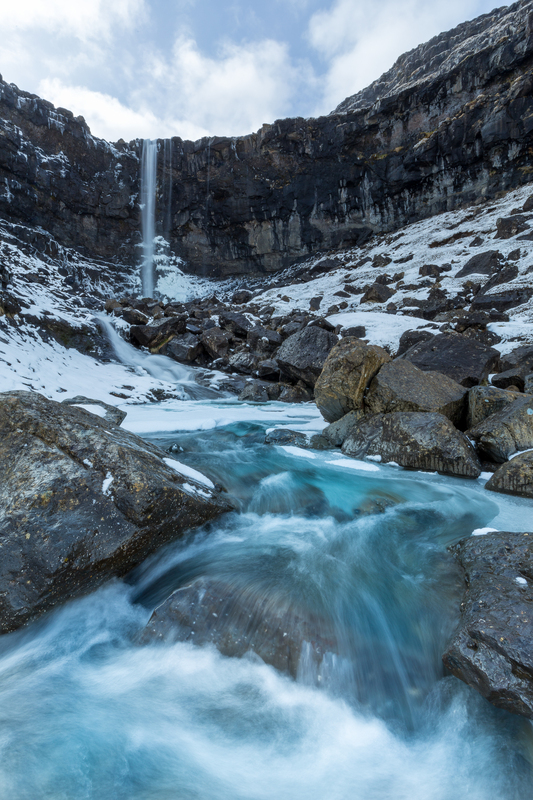 In peak season, these falls — also conveniently right off the road — must be absolutely packed, but in the off-season I had them to myself most of the twenty minutes I spent setting up and photographing the lower of the falls. As I was packing up to leave, the blue skies greyed and darkened, and snow began to fall again as I got back in my car. The snow-off, snow-on weather persisted through the second day as well, but my third day on the island — this time Vágar, home to the Faroes’ international airport and accessible by car only after a 100 króna deepsea tunnel charge — was bathed in sunshine the whole day. From Bøur, the island of Tindhólmur jutted out prominently from the North Atlantic. Arguably more dramatic from above, I munched on dried fish and a Clif Bar for lunch, soaking in the sunshine and wondering if the grass I knew to be everywhere around me might turn green in the remaining days of my trip yet. Thinking that incoming clouds combined with the the clear skies earlier that day might result in a spectacular sunset, I returned to Gásadalur after a dinner of döner. The Czechs I ran into earlier in the day were on the village side of the falls, though I had the overlook of Múlafossur (the name of the waterfall next to the village) to myself. I only managed to get in just a few shots before needing to sprint to the car to flee the rain. As I drove back to Streymoy, I began to see the fog over the water swallow the island of Mykines whole, and by the time I reached Bøur the craggy fingers of Tindhólmur also vanished into obscurity. Each of the two subsea tunnels in the Faroes incurs a 100 kr. toll. This colorless sunset was already my second toll of the trip. The rain lingered into the next day, so I planned my fourth day to be a slow one, exploring the capital of Tórshavn and its museums instead of doing much outdoors. Its art museum is small but intriguing. 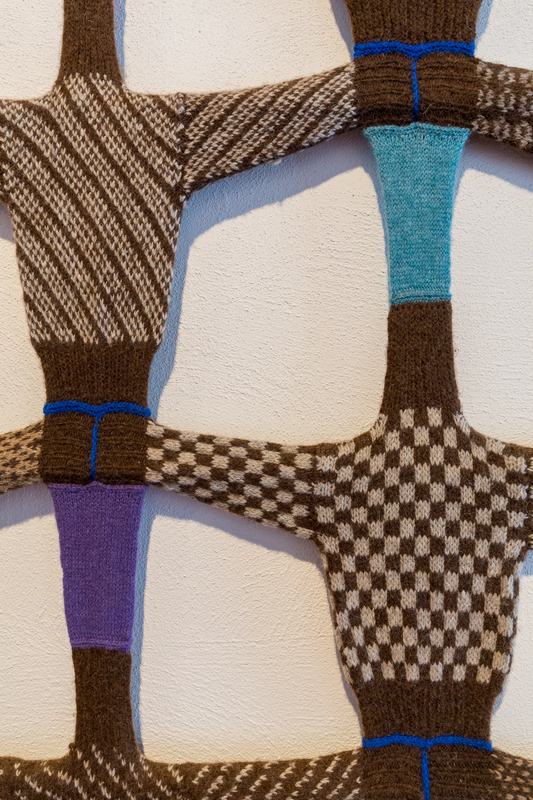 For a culture that regularly faces perhaps the most brutal weather conditions in the world and whose human population is outnumbered by its sheep population, Faroese art is not as unknown as one might assume. Some of it is not unexpectedly steeped in tradition with a certain touch of pragmatism. 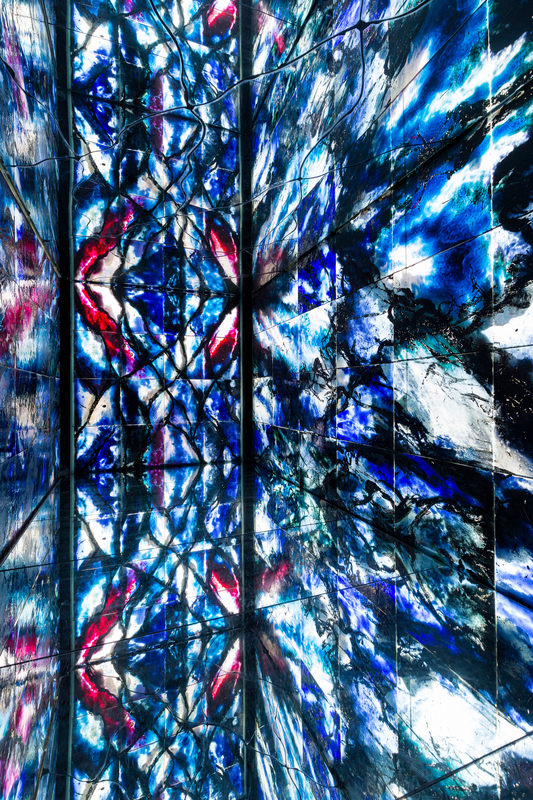 Other works are far more exclamatory, and indeed, contemporary. 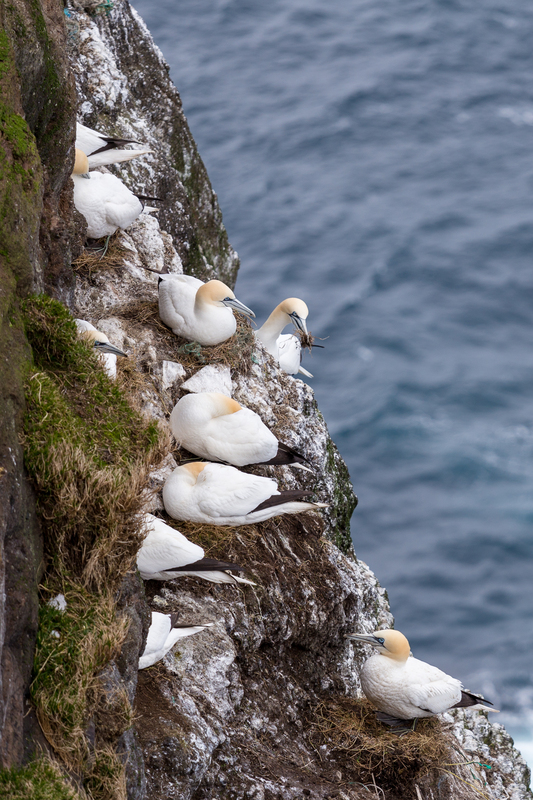 If photographers are increasingly drawn to unexplored landscapes, the Faroe Islands’ other draw is the island of Mykines and the puffin colonies it sports. 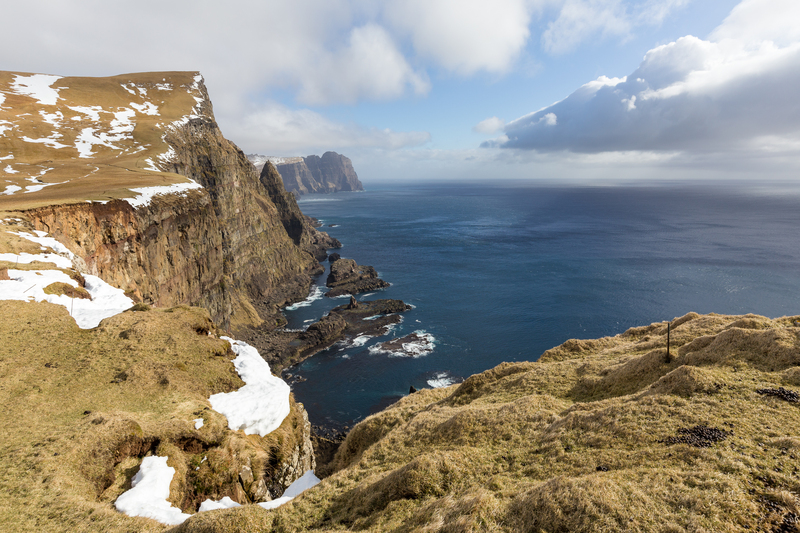 As untamed as the Faroes are unchecked tourism is still an overwhelming industry, so starting in 2018 visitors going beyond Mykines hamlet limits between the months of May and August are required to pay a 100 kr. fee. 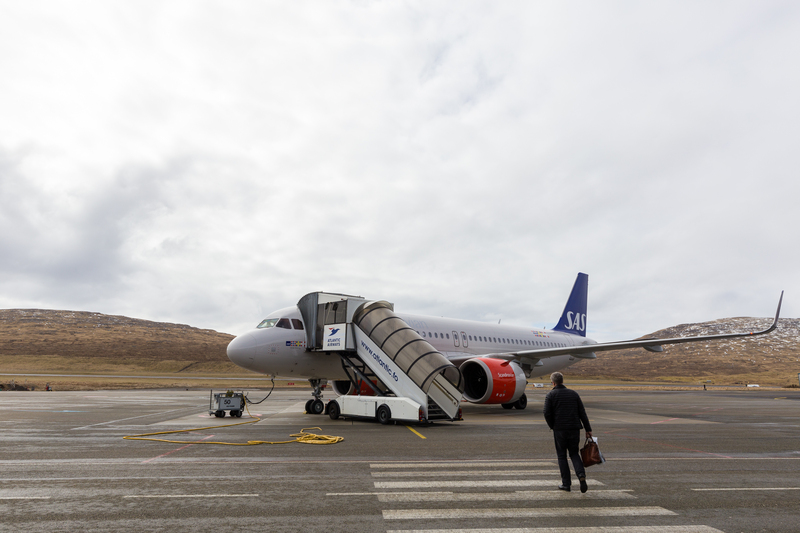 When I went in April, the Visit Faroe Islands website mandated the fee year-round and also ambiguously seemed to require a guide, so to be on the safe side I obliged (but was the only of eight non-local passengers aboard my helicopter flight to do so). 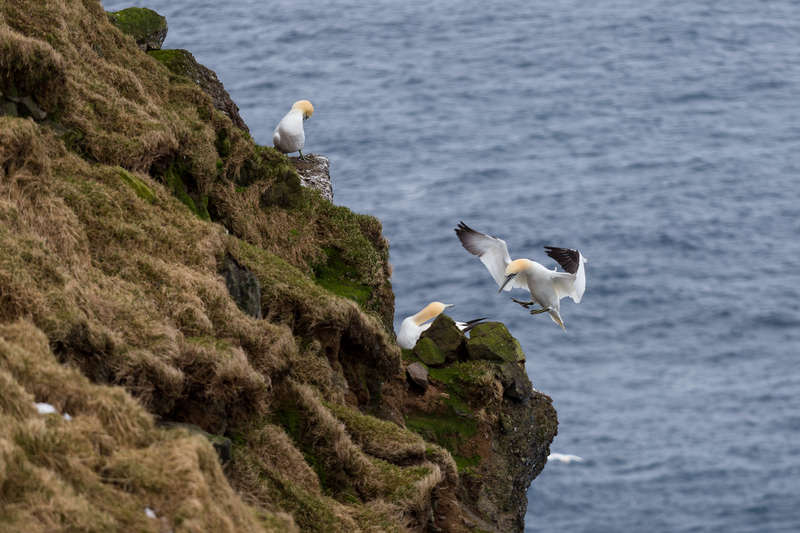 April is about two months too early for puffins to return to their Faroese burrows, but that’s not to say the island doesn’t have other birdlife. I recognized most birds only as “gulls,” which I suppose isn’t entirely inaccurate, but despite asking about and my guide pointing out their differences I was too busy staring the beauty that surrounded me to retain all the features that distinguished one gull from another. While I knew that puffins would not be in my viewfinder, I was expecting my Mykines romp to be about the landscape and not about birds. 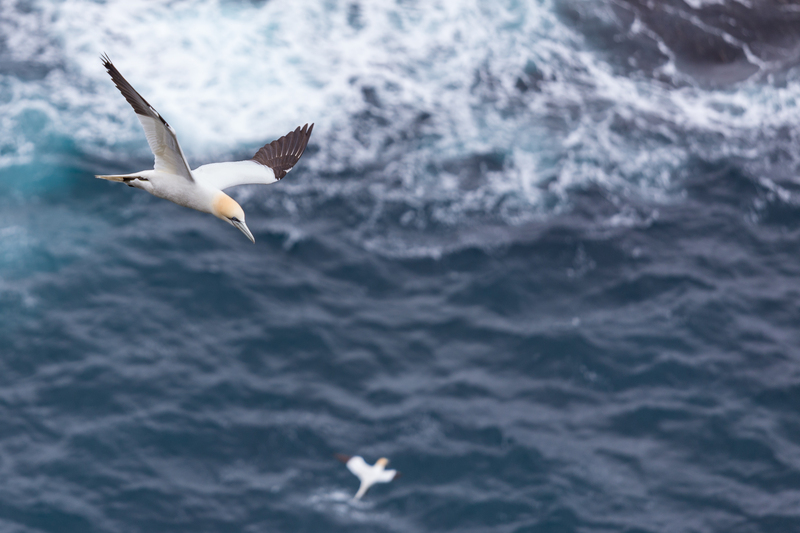 As a result, I wasn’t expecting to meet the Northern Gannet on my trip. 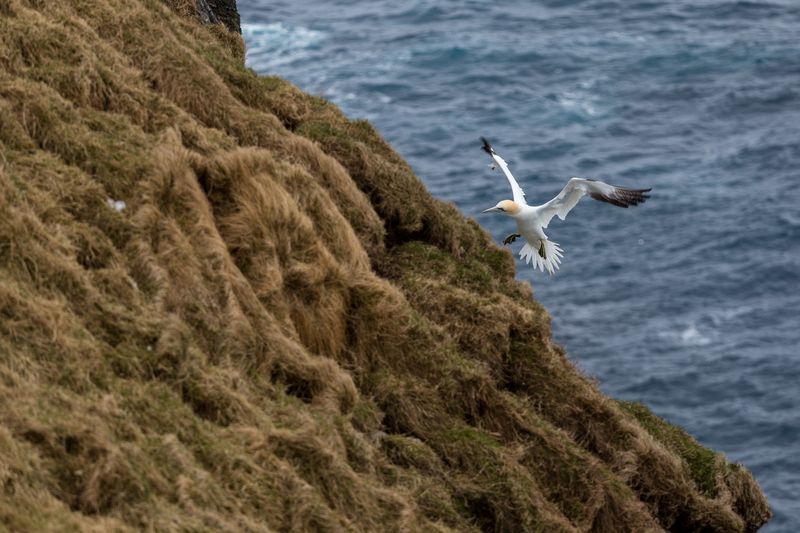 With Heini, an energetic and knowledge Faroese who built his house on Mykines years ago, as my guide I was introduced to several spots where gannet nests filled the cliffside. 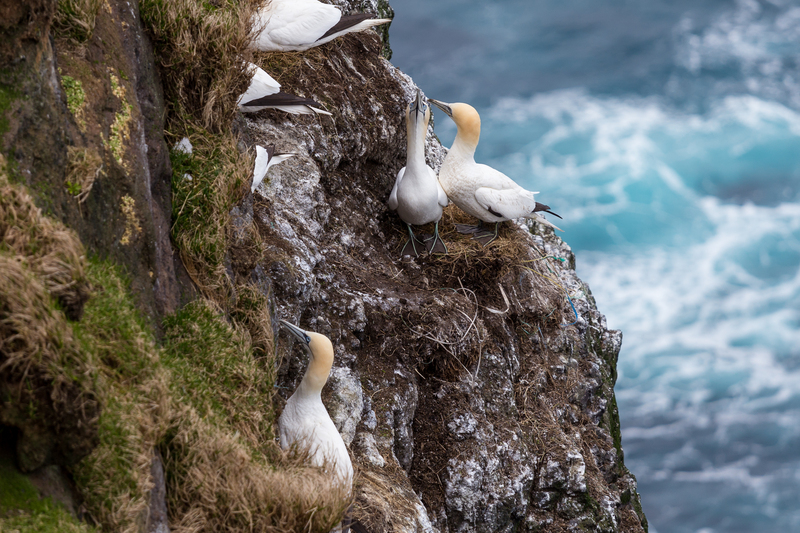 Initially I didn’t think I’d spend so much time on Mykines on bird photography, but boy, was I mistaken. The hike out to Mykineshólmur isn’t long, which made the weight of having a telephoto lens on me seem less like a burden. I snapped away each time we stopped, reminded again that bird photography needs long glass and an enormous dose of patience. 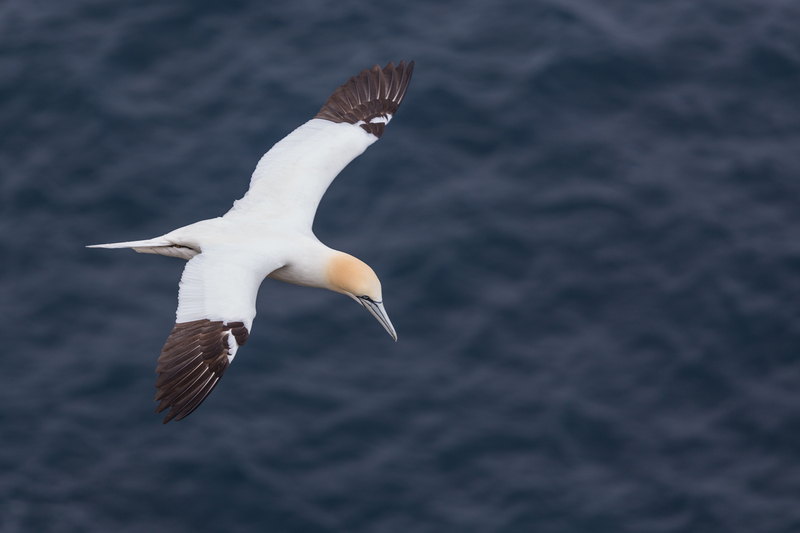 The Northern Gannet is known to be an excellent diver, plunging from flight into water of depths up to 5 m to catch prey. We weren’t far enough out at sea to see this behavior, but having the birds’ duck-like squawking fill the air was impressive in its own right. I think I surprised even Heini with how long my mesmerization with the birds lasted. 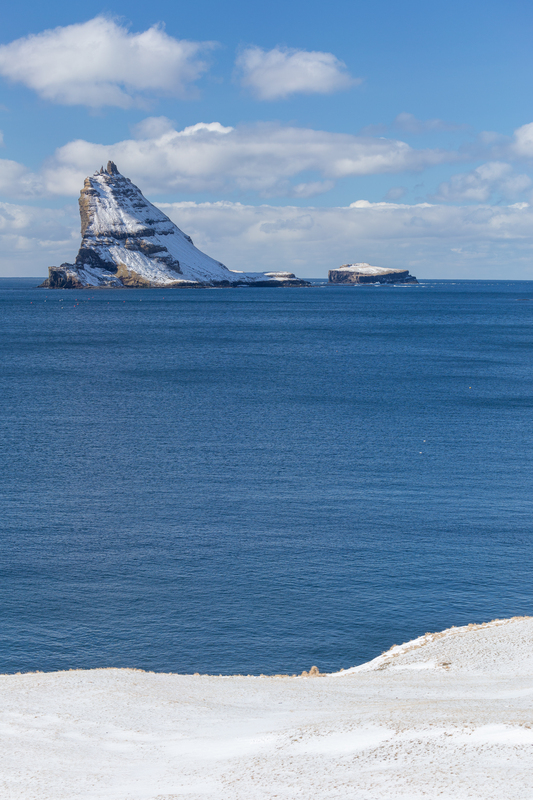 Mykines is accessible only by boat or by helicopter that reduces to helicopter-only service in the winter months, leaving travel to and from the island at the mercy of fog, clouds, and wind. The skies the day I was on Mykines were cloudy but the winds were favorably out of the east, so fortunately, the weather didn’t end up me stranding on the island. I did bring a change of clothes and toiletries just in case. 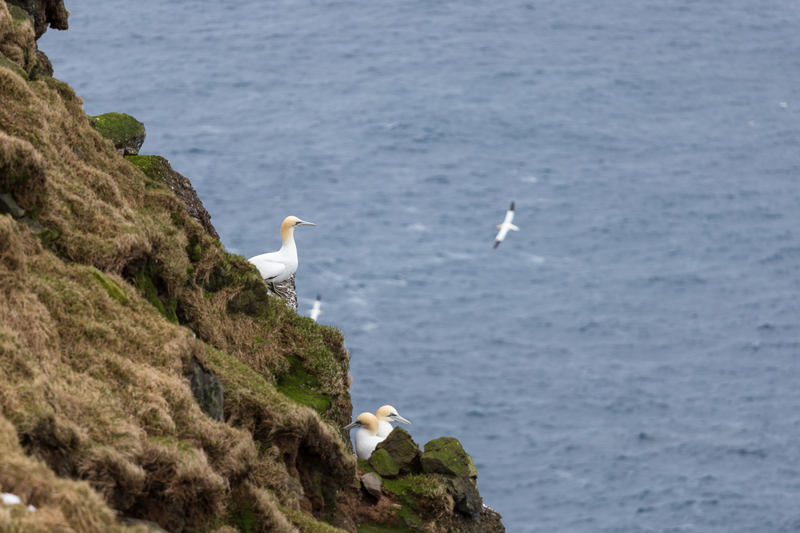 Despite the hike out to the lighthouse — dwarfed by the cliffs before it — taking far longer than my normal walking pace would dictate, I was delighted to have been able to see some wildlife and have the entire islet practically to myself during the entire morning. 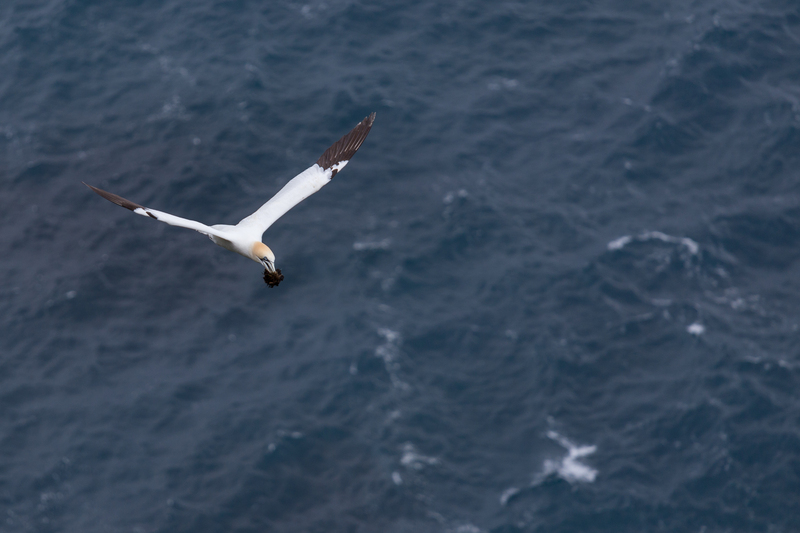 Another perk of hiring a guide on Mykines is that lunch is provided. After dining chez Heini (n.B., pickled herring is delicious when paired with a hardboiled egg — in addition of course to buttered bread and onions), I boarded the helicopter to return to Vágar and civilization. 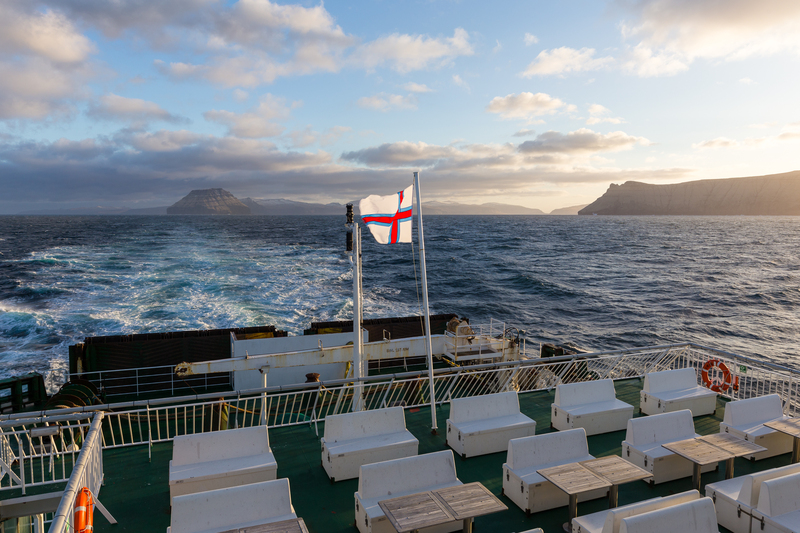 Friday is the only day of the week that a return trip from Mykines is possible in the same day as the outbound, so I was again happy the weather cooperated as we approached Sørvágur. My last island hop was to the southernmost of the Faroes, Suðuroy. 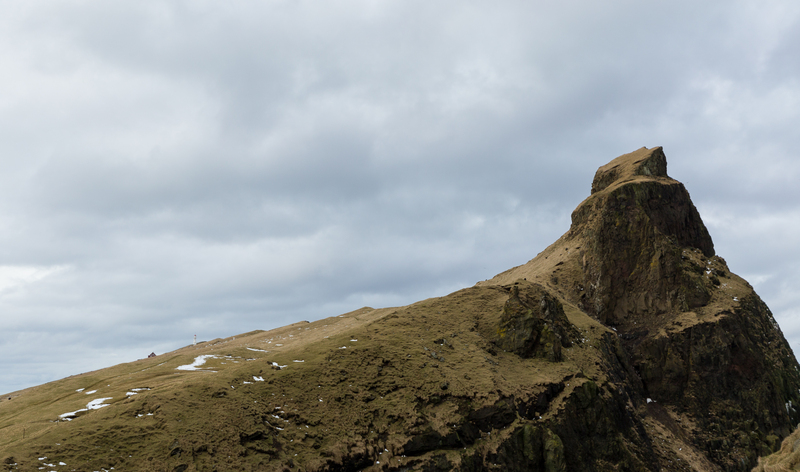 Remote and eclectic, it’s sometimes written that Faroese from Suðuroy lament being the forgotten of the islands, which must say a lot given the overall population density of the archipelago — and the number of towns that have less than a dozen inhabitants. 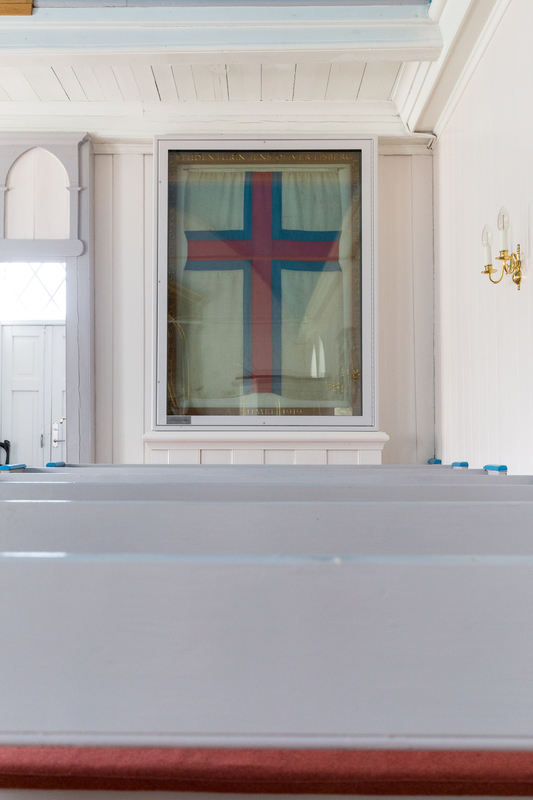 One village in particular, Fámjin, was a notable stop as its church houses the original Faroese flag, Merkið. All the Nordic flags seem to me elegant and regal, and the Faroese variant is no exception. 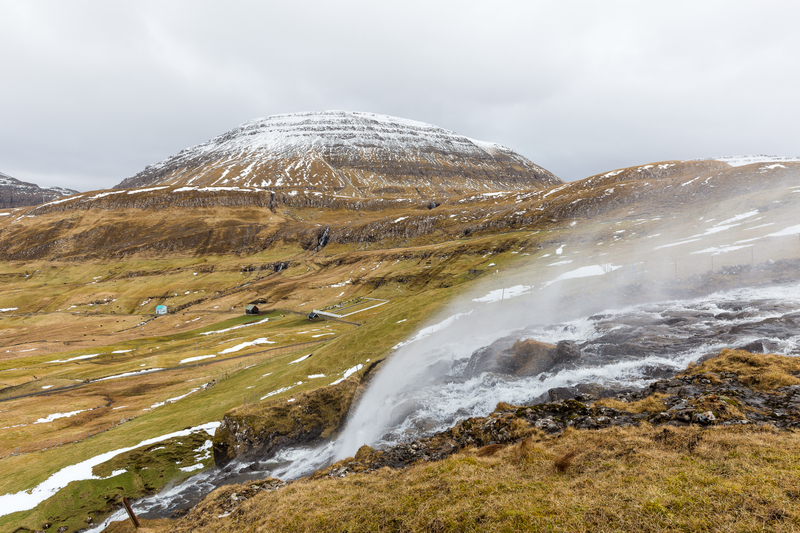 Prior to arriving at the church, I took a small walk off the main road to witness the rather normal Faroese phenomenon of water-notfalls and struggling to stand still against the wind. My friends joke about me blowing away in the wind if it’s gusty enough, but until being in the Faroes I didn’t think it was possible. Standing on the western hills of Suðeroy certainly gave me pause. I left Fámjin and made my way further southward, finding the road to Eggjarnar (also known as Skúvanes) and its views to Beinisvørð. While I encountered spots of snow on the drive up, I didn’t come across a single other vehicle on my drive up. 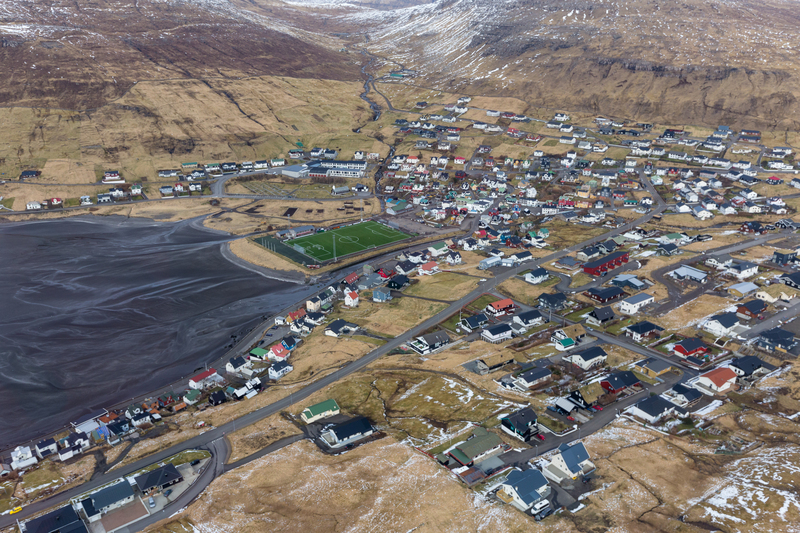 A marker on a map might obscure Singapore and the Faroes equally, but the population density — of humans, anyhow; sheep might be another story — are almost startlingly disparate. Here, too, I was reminded of the power of nature: if the winds above Fámjin were breezy, the ones at Eggjarnar were battering. I gave the cliffs plenty of space as I walked around, taking my cue from the wind howling through the radio antennae of the abandoned LORAN A station to play it extra safe next to the 200 m dropoffs to the sea below. It didn’t take long for my hopes for this trip to be a northern lights expedition to be snuffed out completely as I accepted perpetual cloud cover and the allure of sleep, but on the ferry back to Torshávn the clouds parted at just the right time to grant a warm sunset. 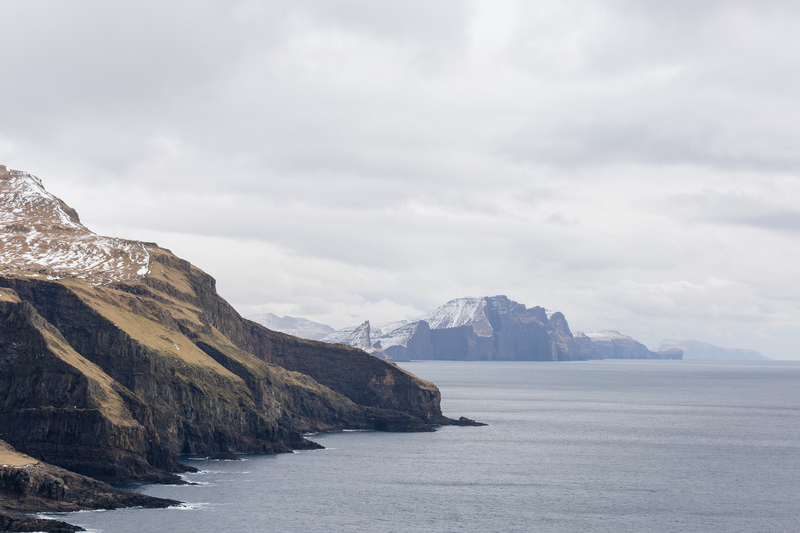 As I stood on the stern of M/F Smyril, leaning into the wind for the third time that day and with tears literally being blown out of my eyes from the force of the wind, watching islands gradually appear and disappear, I began to say goodbye to the Faroes. When I arrived at Søvágur to begin my return to Germany, I didn’t take much notice at first of the plane I was due to be on. I don’t remember exactly what got me looking up its call sign, but at some point I realized this was actually a special plane for me — it was an Airbus A320neo, for real this time: I erroneously (and I call myself a plane geek!) thought and wrote that I had been on two before. This was no misread, however; Ulrik Viking, or LN-RGN as her registration reads, is in fact the third A320neo delivered to SAS. In some ways, my cluelessness to the type of the plane I was going to be on mirrored the same (innocent) ignorance I had of the Faroe Islands. I don’t remember specifically what put them on my list for the first time, and I’m not sure if it was a photograph that subconsciously informed me to their presence or if it was overhearing their name in one of my travels or readings. For fear of missing out on the beauty, I don’t like to let such incredible places catch me without a plan, but stumbling across the sights was perhaps the more dramatic way to explore as it continually upended whatever preconceptions I have of the islands before I arrived. 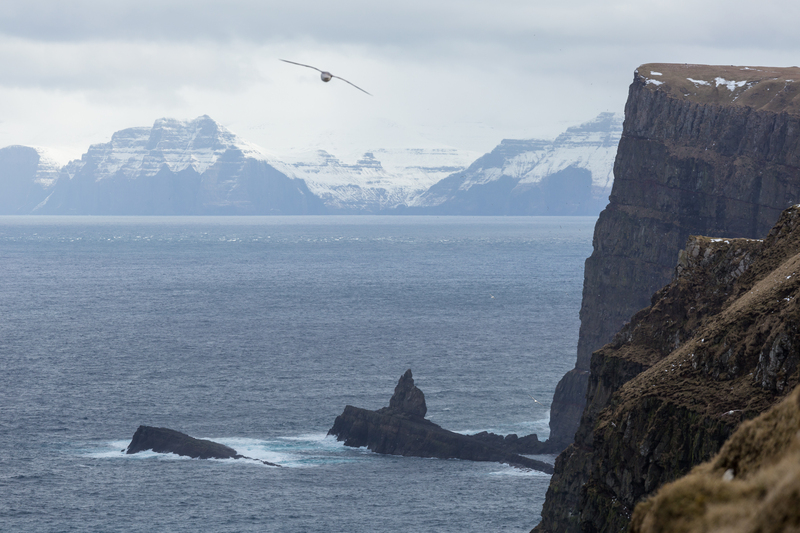 It’s tempting to simplify a description to the Faroes to small, green islands in the middle of the North Atlantic, but just a day there reveals that they are and represent so much more. And, of course, in the winter, they just might not be green, even if they are lushly so the entire rest of the year.